With everything to do and little time to do it in, Rob has managed to fit another serial into the Surf Report’s posting paradigm. Surf Movie Sunday is a limited serial that introduces and reviews a different surf movie with each post. Lightbox Pictures brings us a documentary shot in 2010 of twin Aussie surfers who travel the African coast looking for places to surf. Their motivation is simple: the beaches of Australia can be crowded with tourists, and sometimes surfing there can be a hassle. So they drove all the way down Africa’s west coast, from Morocco through Western Sahara, Senegal, Liberia, Angola, Namibia, and ending in South Africa. There they find plenty of great waves, isolated areas where they can surf uncluttered waters. In some ways the film feels like The Endless Summer, only it’s not like that; it has its own charm with its serious socio-political undertone. Narrated by one of the twins, he tells of how their travels down the African coast opens their eyes to the political situations at play in those countries – the military tensions, the poverty. He points out that people in Africa don’t surf, which I think is sad – they have so much viable coastline, but they’re too busy just living and surviving to really enjoy it. I won’t sit through some boring documentary, I just have to put that out there. We watched about ten or fifteen minutes of Charlie Don’t Surf before we decided to switch gears – we have to be interested in what we’re watching, after all. This was definitely a good movie, and I would watch it again. It clocks in at under an hour, so it doesn’t waste any time. These guys went to surf and they came away with a much larger understanding of the world and how it works. I love that, I wish I could get more of that in my life. It also has a fantastic soundtrack featuring Radical Face, and the wife wanted to make sure that I mentioned that. The music was very good. And you don’t need to take it just from me – this movie has won five awards in different surf movie festivals, for best film, best soundtrack, etc. You won’t find this movie listed on IMDB, but you could head over to their site –> Thirty Thousand: A Surfing Odyssey from Casablanca to Capetown <– where you can watch the trailer, see their awards and buy the DVD. I give this movie . . .
Not every surf movie is going to get a five, but we happened to luck our way into two in a row, didn’t we? It’s probably due to a combination of the cinematic quality of the footage – it’s not a montage of news footage and sound bytes like some surf docs are – the soundtrack, and the inside look at the real world issues they encounter. I really enjoyed watching the way they surf; they’ll catch a wave, stand on the board, and start walking the nose as a way to maneuver the board up and down the face of the wave. They’re not shooting tubes, but doing the everyday surf. Plus the length is perfect – it’s not trying to force the traditional ninety-plus-minute film-length format. Right now this film is available on Hulu, and I think that’s it. Searching on other services gets something akin to a bewildered shrug. So you can watch it on your computer for free, stream it to your devices if you pay for Hulu+, or you can purchase the DVD on the basis of this glowing review and five surf festival awards. I had to do Bruce Brown’s The Endless Summer first, because it is considered to be the seminal surf movie. In this 1966 documentary, Brown follows two California surfers on the “endless summer”, a journey across the world, following the summer season and trying to find waves wherever they went. These two surfers hit Senegal, Ghana, South Africa, East Africa, Australia, New Zealand, Tahiti, and Hawaii, finding new surf spots and meeting new people, having adventures, and spreading their love of surfing across the world. This is the film that inspired future generations of surfers to do the same, and brought surfing to these new places later on. The plot description doesn’t do this film justice, however. From the surf music theme and the Disney-esque incidental music, to the wisecrack-laden narration that kept us laughing through most of the movie, this film serves as both an education in what surfing looks like and an inspiration to go find some waves and see what you can do on them; certain points of the narration feel like you’re gleaning important pointers, too – Brown talks about how surfers deal with shallow surf, vertical corals, waves that break against a wall, waves that come in diagonally to the shore (I think if you start on the near end you can ride pretty far out), et cetera. I felt this movie was so worth my while I kept it in the queue because I want to see it again. In other words, I give this movie . . . I can’t recommend this movie highly enough. The narration is wonderfully humorous, the surfing is real, the movie was over before we knew it. Even more to it’s credit, the wife enjoyed it and laughed right along with me and found it very interesting, so crazy-surf-otaku-Rob is not leading you up the primrose path, I promise! 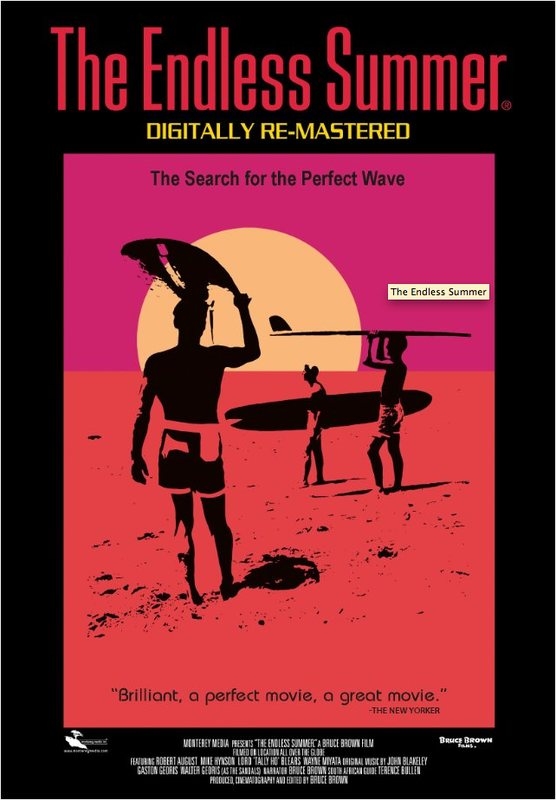 If you subscribe to Hulu Plus or Amazon Prime, you are in luck – The Endless Summer is available on both right now. Sorry Netflix subscribers, you got left in the cold. If you subscribe to a service that offers this film or know how to otherwise see this movie for free (legally) then please let us know it the comments below.